2 Autogramme und 6 Prizm Refractor Cards per Box !!! 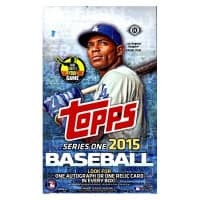 Produktinformationen "2014 Panini Prizm Baseball Hobby Box MLB"
Look for One USA Baseball, Rookie Reign, and Diamond Dominance Insert Per Box. Find On-Card Autos featuring: Mike Trout, Manny Machado, Jose Fernandez, Buster Posey, Clayton Kershaw, Chris Davis, David Ortiz, Dustin Pedroia, Greg Maddux, Tom Glavine, Pete Rose, George Brett, Mariano Rivera, Ken Griffey Jr, Cal Ripken Jr, Chipper Jones, George Brett and more! 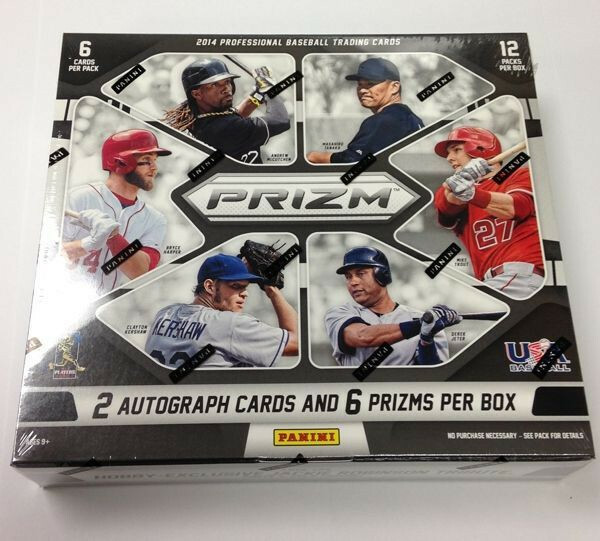 Each box will deliver a Prizm parallel in every other pack including three #'d Prizm Parallels! Possible #'d versions include: Purple #'d/99, Blue Mojo #'d/75, Orange Die-Cut #'d/60, Jackie Robinson Tribute #'d/42, Red #'d/25, Gold #'d/10, and 1/1 Black Finite. *NEW* On-card die-cut autos #'d/99, 25, 10, and 1/1! New inserts to 2014 Prizm Baseball include: Intuition, Diamond Dominance, Golden Leather Die-Cut, Rookie Reign, Chasing the Hall, and Next Era. Find one in every other pack! 50 players including Mike Trout, Manny Machado, Chris Sale, Mark Trumbo, Brandon Phillips, Jose Bautista, Yoenis Cespedes, Buster Posey, Jose Fernandez, Evan Longoria, Troy Tulowitzki, David Ortiz, Clayton Kershaw, Jordan Zimmermann, Pete Rose, Jeff Bagwell, Mark Grace, Craig Biggio, Don Mattingly, Edgar Martinez, Paul O'Neill, Chris Davis, Tom Glavine, Darryl Strawberry, Jean Segura, Matt Carpenter, Miguel Sano, Jameson Taillon, Noah Syndergaard, Jose Abreu, Kris Bryant, Byron Buxton, Archie Bradley, Jonathan Gray, Clint Frazier. The following 10 Players: Bo Jackson, Ken Griffey Jr., Cal Ripken Jr., Bo Jackson, Frank Thomas, Nolan Ryan, Pedro Martinez, Mariano Rivera, Greg Maddux and Chipper Jones. The following 10 players: Max Scherzer, Manny Machado, Eric Hosmer, Evan Longoria, Dustin Pedroia, Pedro Alvarez, Michael Wacha, Paul Konerko, Clayton Kershaw and Buster Posey. 30 players including Xander Bogaerts, Taijuan Walker, Kolten Wong, Tim Beckham, Billy Hamilton, Michael Choice, Yordano Ventura, Jonathan Schoop, Matt Davidson, J.R. Murphy, Travis d'Arnaud, Chris Owings, David Hale and Jimmy Nelson. 50 players including Rusty Greer, Brandon Phillips, Steve Finley, Archie Bradley, Rick Monday, Kevin Seitzer, Steve Sax, Lee Smith, Rick Dempsey, Dexter Fowler, Ron Darling, Lee Mazzilli, Ron Gant, Fred Lynn, Allen Craig, Shawn Green, Jose Altuve, Jon Jay, Wei-Yin Chen, Evan Longoria, Troy Tulowitzki, Stephen Strasburg, Evan Gattis, Tony Pena, Elvis Andrus, Ellis Burks, Frank White, Jesse Barfield, Pat Tabler, Patrick Corbin and Kevin Millar. 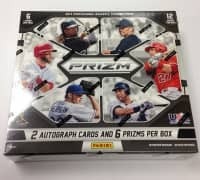 Weiterführende Links zu "2014 Panini Prizm Baseball Hobby Box MLB"
Fanbewertungen für "2014 Panini Prizm Baseball Hobby Box MLB"